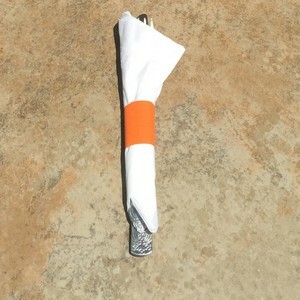 Pegasus Ventures brand paper napkin bands wrap your restaurant's silverware. Wrapping silverware with napkin bands turns tables faster. Replacing and removing wrapped silverware also gives your restaurant a more professional, cleaner appearance when wait staff is not handling silverware with their hands. Wrapping silverware with Pegasus Ventures brand restaurant napkin bands turns tables faster. Replacing and removing wrapped silverware gives your restaurant a more professional, cleaner appearance as wait staff no longer handle silverware with their hands. Choose Pegasus Ventures brand napkins bands for use with paper napkins in boxes of 2,000 or cases of 20,000. Cases of 20,000 restaurant napkin bands serve restaurants, caterers and other food service businesses regularly wrapping silverware while smaller boxes of 2,000 napkin bands work great for smaller events such as weddings, business meetings, and family reunions. 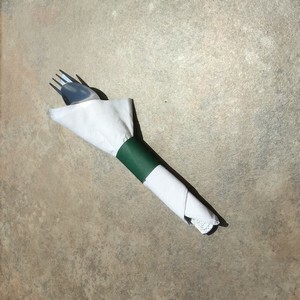 The standard 1.5" x 4.25" napkin bands to wrap silverware with your restaurant's paper work with paper napkins and come in more than a dozen number of colors, as well as Kraft recycled paper when looking for a green-friendly option. Using linen or cloth napkins in your restaurant? Pegasus Ventures offers the larger 1.5" x 6" napkin bands to wrap your restaurant's silverware with cloth or linen napkins. 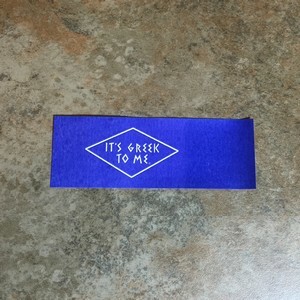 Looking for a custom printed and personalized napkin band to wrap your restaurant's flatware? Pegasus Ventures can print a paper napkin band with your restaurant's logo and other information. Custom printed napkin band are also a great idea when promoting an event and, of course, for restaurants who offer off site catering a personalized napkin band wrapping the flatware ensures every guest knows the name, website, and telephone number of the restaurant providing the excellent food, drink in a place where there is no competition. Click or tap here to learn more about custom printed restaurant napkin bands! Custom printed napkin bands to wrap restaurant silver and flatware with paper and linen napkin bands to promote a restaurant's brand, a non profit the restaurant works with or perhaps a local event. Burgundy restaurant napkin bands to wrap with paper napkins- 2,000 1.5" x 4.25"
Red restaurant napkin bands to wrap with paper napkins- 2,000 1.5" x 4.25"
Hunter Green restaurant napkin bands to wrap with paper napkins- 2,000 1.5" x 4.25"
Light Blue restaurant napkin bands to wrap with paper napkins- 2,000 1.5" x 4.25"
Royal Blue restaurant napkin bands to wrap with paper napkins- 2,000 1.5" x 4.25"
Bright Yellow restaurant napkin bands to wrap with paper napkins- 2,000 1.5" x 4.25"
Chocolate Brown restaurant napkin bands to wrap with paper napkins- 2,000 1.5" x 4.25"
Cream restaurant napkin bands to wrap with paper napkins- 2,000 1.5" x 4.25"
Orange restaurant napkin bands to wrap with paper napkins- 2,000 1.5" x 4.25"
Navy Blue restaurant napkin bands to wrap with paper napkins- 2,000 1.5" x 4.25"
Printing napkin bands for restaurants now over a decade Pegasus Ventures delivers the best in food safe napkin bands for restaurants printing using water based inks as well as water based adhesives. A selection of more than a dozen colors, and Natural Kraft recycled paper, Pegasus Ventures brand napkin wraps stand ready to ship the next business day when your restaurant is looking for a stock, single color napkin bands to wrap your restaurant's flatware. Custom printed and personalized restaurant napkin bands printed from Pegasus Ventures can be found in quality restaurants all over North America and as far away as Italy. Generally, your paper napkin bands are printed and ship about two weeks after being ordered. Not bad for a small business, and small business is Pegasus Ventures. Customers are surprised when calling when they find Pegasus Ventures is not a giant company. We won't need to look you up by an order number, Pegasus Ventures will know your name. Maybe someday the company will be that big, but for the time being we're happy to serve our customers order by single order getting the work done and promptly shipped out to your restaurant.